Our desert rose flowering again. 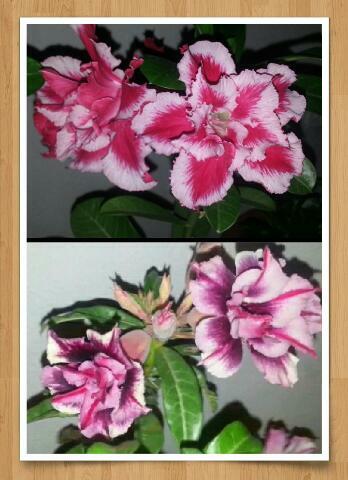 This time we have two varieties blooming at the same time, the bright pink and purplish petals.. I have missed collecting the seeds from the last blooms, I must collect the seeds this time round to plant more desert roses. I have recorded down the flowering process of its full blooms over the period of 7 days in this video. Oo these are VERY nice! My big desert rose plants are the plain 5-petal types. The fancy ones I bought recently are small plants which hardly flower.